On 8 October 2018 an Arab terrorist brutally slaughtered two young Jews in the Barkan industrial area that encourages coexistence between Israelis and Palestinians. The terrorist was able to carry out the planned attack as he worked there as an electrician. As usual there was silence from the main stream media because dead Israeli Jews do not matter. 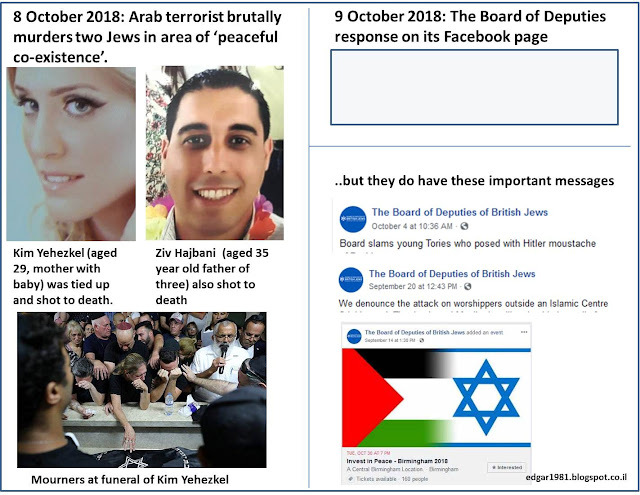 The Board of Deputies of British Jews is clearly happy to keep the silence (as it was on the murder of Ari Fuld). (Nothing on the regularly updated BoD twitter feed either).